Reece’s family sent us some new pictures of our chocolate boy! Kim says that Reece is still a cuddle bear and continues to be a positive influence on their former foster puppy, Urban, who they also adopted. he has had no real issues with his elbow either, which is awesome! we will be getting together with him and his family on the 29th, so stay tuned for new pictures. This year I’ve decided to take part in the Assistance Dog blog Carnival and the topic is decisions. Over the past 15 years I’ve had to make many decisions in regards to applying for, working with, retiring, and then raising an assistance dog. Not many people can actually say they’ve been involved in all areas of the service dog experience, but here’s my story. In the summer of 1993 my shunt (a tube which runs from my brain into my abdomen) blocked. This caused the cerebral fluid around my brain to build up and create pressure which damaged my optic nerves. In a matter of a couple weeks, I went from seeing 20/20 to seeing nothing out of my left eye and only through 3 pin holes in the very centre of my right. It was tough at first, but I had the support of an amazing vision teacher who re-taught me everything from completing daily tasks to getting around the world with a white cane, in addition to a mother who refused to see me any different from the daughter she had given birth to 13 years prior. Now that I’ve laid out some background information to my story, let’s move on to the day I decided to apply for my first guide. From the first day I was introduced to the white cane I knew I had to get rid of it. I hated the way it felt in my hand, the way people looked at me, the ways it limited me, and well….it was just plain ugly! I made a point of telling my vision teacher this almost every time we had a lesson until the day she told me about guide dogs. I had always wanted a pet dog and to know there was a way of both getting rid of my cane and having a dog of my own, I told her I’d do anything she wanted. She told me that if I worked hard over the next couple of years she’d help me convince my parents to let me get a dog and that she’d help me with the application. 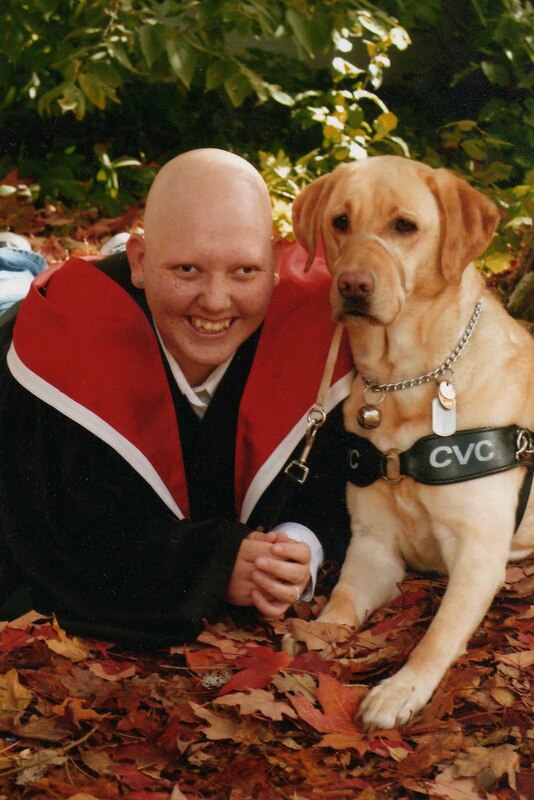 It was a long 3 years, but finally in January of 1997 my vision teacher and I began researching programs and decided on the Lions foundation of Canada Dog Guides because it was close to my hometown (Aurora, Ontario) and because the classes were small. I received my first guide, Gryphon, in August of that year and put my white cane on the shelf forever. Gryphon was a 21 month old tall, slim, male black labrador retriever who weighed about 81lbs. We were matched around August 1st of 1997 and worked together for only a year. Gryphon was not the right dog for me, but he worked well and the trainers felt he was a good fit for a young first time handler, who just happened to be the youngest they’d ever accepted into the program. Gryphon was a great dog and he taught me tons, but we never bonded the way a working team should so, when he was career changed after only a year I wasn’t too upset. Gryphon had become traffic shy after an altercation with a car in Toronto and both the trainers at LFC and myself were unable to get him past his fears. He was later retrained as a special Skills Dog and worked for a while before being retired for health reasons. Phoenix and I were matched in July of 1998 and worked together for almost 7 years. I remember our time in class together, he was only 20 months and full of personality. From day one he has always had his opinions on how things should be done and has never been afraid to let me know what he’s thinking. We attended my final year of high school together and then completed an entire honors degree at the University of Guelph. 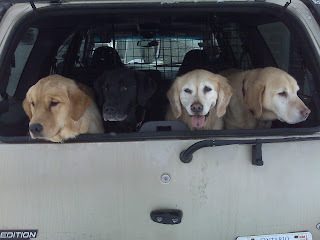 Phoenix had severe separation anxiety until he retired so accompanied me on excursions I’d never dream of taking Cessna to – a packed Montreal night club, the outdoor Walkerton Country Music Festival or full day visits to Canada’s Wonderland, just to name a few. 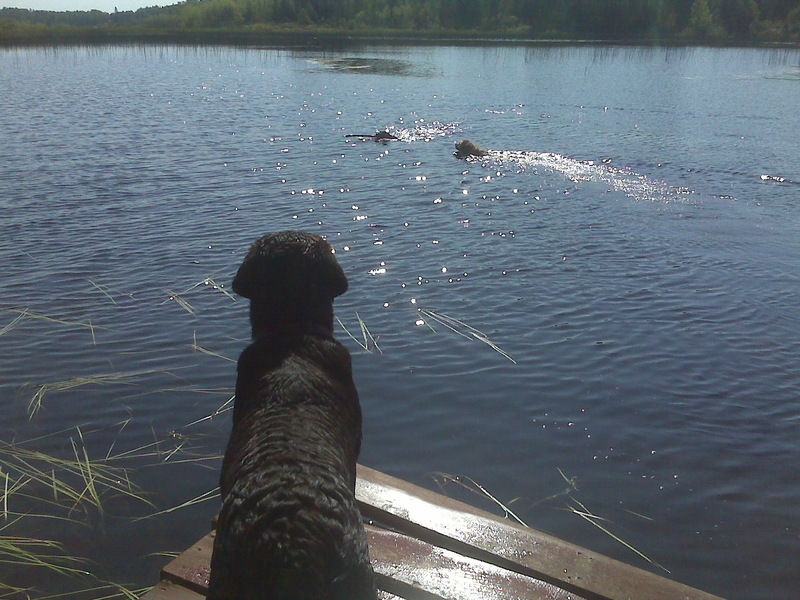 Phoenix was always faithful and willing to work at any hour and in any environment, but at the age of 8 and a half he began slowing down and wanting to just chill at home rather than work, so I knew it was time for retirement. It was a hard decision because we had developed such a bond and I worried about hurting his feelings by getting a new guide to replace him. But, most of all I worried about the training process and the hardships involved in bonding with a new working companion. Cessna and I were matched on May 27th, 2005. She was not truly ready to be responsible for a blind person but the trainers had confidence in my abilities and saw the chemistry between us. Cessna was only 18 months so had tons of maturing left to do. She barked at other dogs out of excitement, jumped around like a kangaroo when she saw squirrels or birds and couldn’t settle in my social work classes without a long run beforehand. This crazy, immature puppy is long gone and has been replaced by a mature, sensitive companion who desires to learn more everyday. Over the past 5 years Cessna and I have worked hard to understand what each other needs and have become a dream team. With all the skills and experience I obtained “training” Cessna, I began looking for other learning opportunities and learned about Autism Dog Services. Huib and I had talked about what it would be like to raise an assistance puppy and had even gone as far as asking the LFC for a puppy to foster. We were told that instead of having to explain to some clients why they couldn’t raise a puppy when others could, that they had made it their policy to refuse everyone, but they said nothing was stopping us from fostering for another organization. Autism Dog Services was started by a former LFC trainer whom I knew from training with Gryphon and Phoenix. A couple LFC foster families we knew began raising puppies for ADS and suggested we contact them to see if we could also be of help. After a few e-mails back and forth we made the decision to welcome a 10 week old caramel coloured Labrador retriever into our home on March 1st, 2008. We fostered Aiden until he was 13 months of age and began raising Reece in February of 2009. Our experience with autism Dog Services was both gratifying and heart aching. We loved having Aiden and Reece in our home and are thankful to have been given the opportunity to help ADS in providing independence and safety to children with autism, but this experience has also left us with some lessons. We don’t regret our decision to help raise Aiden and Reece for Autism Dog Services, but wish this experience didn’t have to be another hat placed on the shelf of tough lessons learned. 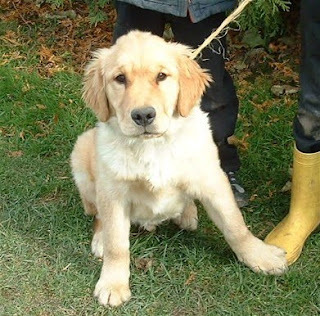 Since cutting our ties with autism Dog Services we made the decision to purchase a male golden retriever in December of 2009 and raise him as our future stud dog and obedience champion. Canyon is not a service dog, but he has taught me further lessons about loyalty and thinking outside the box. He will go for his health clearances in June and hopefully begin producing offspring who will carry on his temperament and lust for life and who knows, maybe one of them will become an assistance dog in the future. Today (December 20th) Reece turns 2. It’s hard to believe it’s already been a year and a couple of months since we gave him up. As everyone knows, Reece was washed from the Autism dog Services program in October of 2010 because of his elbow. It was a really hard decision to forgo adopting him, but with the diagnosis of an ununited coronoid process we knew that it would be unfair to take him and not be able to afford the surgery he would almost certainly require. In addition to this Reece had given us a run for our money and caused a bit of a rift between Huib and himself – he will be forever known as our $5,000 puppy! Huib did not have the opportunity to really get to know Reece, so did not have the bond I had with him. I spent many hours working on skills with him while Huib was at school or work and when Huib left to begin working in Kirkland Lake Reece and I developed an even stronger bond. But, there was still that underlying distrust of whether he might decide to chew something while confined and the fact that Cessna just couldn’t bond with him, so we made the decision to let ADS place him and hope that we would get a chance to keep in touch with his new family. Reece was adopted around the end of November by an ADS family and shares the house with their foster puppy who had also been washed from the program. Urban is also a chocolate lab, but was disqualified for digestive issues and over activeness. At first Reece’s new family wasn’t sure they could handle the two boys, but within just a short period of time they noticed Reece was a positive influence on urban, teaching him to calm down and relax. Reece and Urban have become the best of friends and will often be found napping together. We have been lucky to see Reece on a semi-regular basis. He lives in Kitchener and we see him almost every time we visit Waterloo. Reece has not had any real elbow issues since becoming a pet and the orthopedic surgeon told his family that at this point he wouldn’t benefit much from the corrective surgery. During our last visit to Waterloo we got together with Reece. It was so wonderful to see him, he looks great and was super excited to see us. I wanted to post some updated pictures of him, but Huib was distracted and forgot to take some. Hopefully in January or February we’ll see them and get some pictures to share. Happy 2nd birthday Reece’s Pieces! You were a little terror at times, but you have left a paw print on my heart that will never be forgotten. You have grown up to be such a handsome and wonderful boy and I look forward to keeping in touch with your family for years to come.